Q: How is a Classic Dash better than an original? Answer: There are two considerations; style and functionality. Often cars came with huge linear speedometers, no tachometer, and “idiot lights” to monitor key functions and sometimes faux wood grain or fabric inserts. Not only can you update the look of the dash by selecting a matte black, brushed aluminum or carbon fiber finished panel (and trim pieces, with some applications), and equip it with gauges styles that range from classic to contemporary, but it’s easy to keep tabs on the systems and spot things like declining oil pressure and voltage or increased water temperature. This warning lets you take corrective measures before it’s too late. Q: What are the Classic Dash panels made of? Answer: They are manufactured in-house using a special 5/32” thick UV-resistant ABS composite material. Q: How durable are they? Answer: Structurally, they are as strong —or stronger— than OEM panels. Answer: You can choose between a matte black, brushed aluminum or carbon fiber finish. Q: What are the gauge choices? Answer: Depending on the application, there are approximately 15 Auto Meter gauge styles to choose from. They include American Muscle, Ultra-lite, Phantom, Sport Comp, Carbon Fiber, Cobalt, Ultra-lite II, Phantom II, Sport Comp II, GT series, C-2, and NV models, Also available are some “Thunder Road” gauges. Q: Are they mechanical or electric? Answer: Both are available, although most enthusiasts prefer electric. Q: How is an electronic speedometer better than cable driven? Answer: Versatility is the primary advantage. A mechanical speedometer uses a cable driven by a gear inside the transmission, so when you install a new speedometer it will give you the same output you had with the old speedo, an electric speedo reads electric pulses that are counted and converted to miles per hour. This may be important to correct issues that come from a taller tire wheel combination, or a gear change in the rear end that makes a cable driven speedometer give a false output. The electric speedometer has a calibration circuit in it that allows the user to calibrate the speedometer to show the correct speed. Q: Which gauges are typically employed? Answer: By far the most popular group of six gauges includes the 3-3/8” diameter speedometer and tachometer, plus 2-1/16” diameter oil pressure, water temperature, voltage and fuel quantity gauges. Answer: Yes, panels can employ other gauges —or they can be mounted in auxiliary panels. Some choices include oil temperature, boost and even a clock. Q: Can I use my own gauges? Answer: Yes, panels are available individually for those who have purchased gauges. Q: Are panels available for 2-5/8″ gauges? Answer: Yes, larger gauges are available in some applications (space permitting). Q: Are blank panels available without holes? Answer: Certain panels are offered with no holes, but they are not a stock item and must be special ordered. Q: What tools are required for an installation? Answer: For the most part only common hand tools (screwdrivers, wrenches, pliers, are needed —plus a soldering iron, heat source and test meter (multimeter). Q: Are wiring kits available? Answer: Yes, complete wiring kits are offered for most short sweep gauge applications; they come with an illustrated 24-page instruction booklet. Kits are also available for Nova/Camaro quad pods. Q: How do I calibrate the new speedometer? 1. With the power off, push and hold the calibration button located on the front of the speedometer. While holding the button, start the vehicle and continue to hold the button until the pointer sweeps to full scale and stays at full scale. You may now release the button.2. Drive to the beginning of a pre marked two mile stretch of road (i.e. a toll road with accurate mileage markers) and come to a stop. It does not matter how far away the stretch of road is. DO NOT shut off the engine. Push the release button and the pointer will drop to half scale. 3. Drive the two mile distance. The pointer will remain at half scale mark no matter what speed you choose to drive the two mile stretch. If the speedometer has an LCD display odometer, it will be normal to see it counting rapidly as it receives a speed signal. If you have to stop during the calibration that is OK. The speedometer is simply counting pulses during this time. 4. At the end of the two mile distance, come to a complete stop, push and release the release button. The pointer will drop to 0 and the calibration will be stored. Q: Are there differences in fuel quantity gauges? Answer: Yes, they vary by vehicle manufacturer. The key is the Ohm value when the tank is empty. Some of the more popular values are 0-30, 0-90, 73-10, 16-158 and 240-33. Classic Dash furnishes the correct unit for the application. Q: Can I use existing sending units? Answer: No, you should use the oil pressure and water temperature sending units that come with the Classic Dash package to ensure accuracy. Q: How can I tell what the dash will look like? 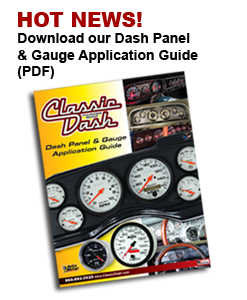 Answer: All available combinations of dash panel finishes and gauge types can be seen on the company’s website (www.classicdash.com). Just click on the desired panel finish, then the gauge model, and you’ll be served up an image of a complete panel, plus individual gauges. Q: Is there a warranty with the gauges? Answer: Auto Meter gauges are backed by a one year warranty. Experience has shown that any problems will manifest themselves within the first year. Answer: Thinking of the gauge like a clock, the half sweep gauges go from about 10 to 2 o’clock. Full sweep gauges are about 7:30 to 4:30. Q: How long should an installation take? Answer: Most installations can be performed in 6-8 hours. Once a person has done an installation, the second one goes much quicker —about half the time. Some vehicles are more complex and tighter-fitting than others and will require more time. Q: Do they require dash frame modifications? Answer: In most cases it’s a simple bolt-in situation, however minor trimming may be required to achieve proper fitment. Understand, too, that some older cars (Camaro comes to mind) were built in two factories (Ohio and California) and were not 100% identical, nor were production methods as accurate and consistent as they are today.